that I would rid the city of the evil that took their lives. No matter what that evil looks like or becomes. I believe someday I will make good on that promise. Did you like The Dark Knight? Part of what gave The Dark Knight such a fantastic story was its grounding in a story of deuteragonists. 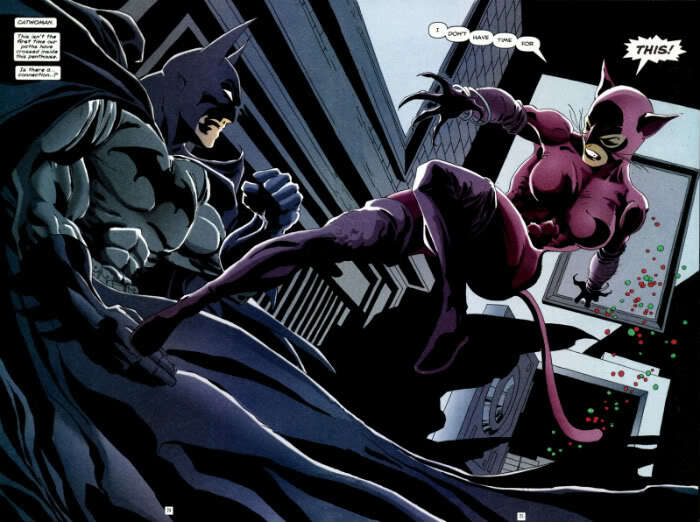 Batman and Harvey Dent – and, to a lesser extent, Commissioner Gordon – offered parallel extremes of the same goal, respectively lawless and lawful agents of the status quo in Gotham with an unending desire to see their city freed of the crime that only seemed to grow more rampant and infectious during Batman Begins. That story, and keeping both characters at centre focus in their campaign to rid Gotham of the Joker, is one of The Dark Knight’s greatest strengths. That story drew inspiration from a little comic called The Long Halloween. Still a fairly neophyte crimefighter, Batman faces a problem when two prominent crime families – the Falcones and the Maronis – trigger an escalating war that threatens to destabilise Gotham. Things are made worse when a serial killer, nicknamed “Holiday” for their apparent preference for homicide on days of celebration, appears and exacerbates the situation. Faced with this kinda huge problem he’s not quite good enough to deal with on his own, Batman forms an alliance with Commissioner Gordon and ace attorney Harvey Dent in a bid to “bend the rules, but not break them” for the sake of protecting Gotham as a united trio. Unfortunately, as time goes on, those rules start to crack apart almost as much as their alliance does, as paranoia and circumstance take root and bring Gotham to the brink of destruction. That paragraph kinda sounds almost like an overblown movie trailer, doesn’t it? Perhaps I should switch careers. 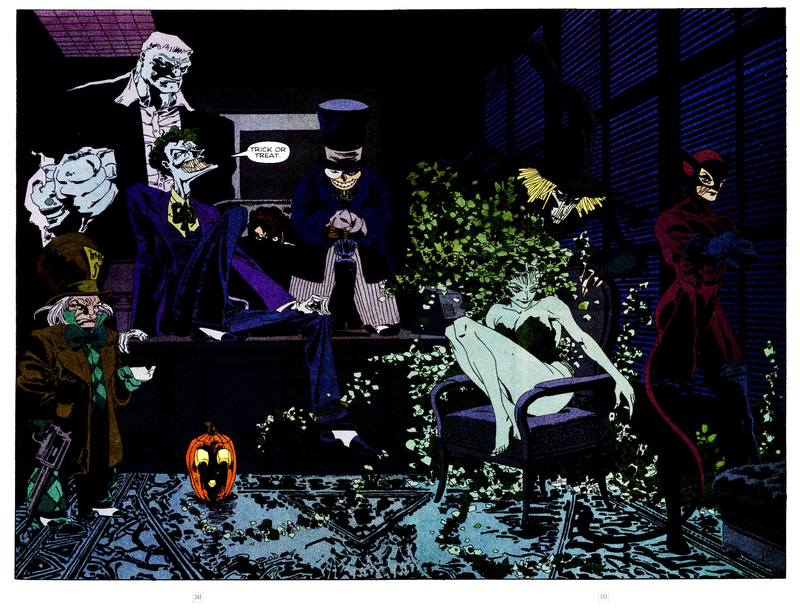 The Long Halloween came about in 1996 at a time when company crossovers and multiple-title stories were in abundance, meaning anyone wanting to get in on Batman’s comic activities – especially in the wake of Joel Schumacher’s Batman Forever film in 1995 – had to purchase sixteen different ongoing books just to get at one narrative. Seedless to nay, a straight-talking 13 issue story that only required books with the same title to be purchased monthly was just what people who were after a cohesive and coherent story needed. While it’s not as genre-defying or groundbreaking the same way The Killing Joke and The Dark Knight Returns were, The Long Halloween still holds a respectable spot on readers’ lists as not only a great story but a proper fleshing out of Harvey Dent’s backstory. The poor man’s journey from single-minded White Knight of Gotham to psychotically-twisted bipolar victim Two-Face is tragic, benefiting from the darker tone of the 90’s comic scene and the straight arrow of the narrative. 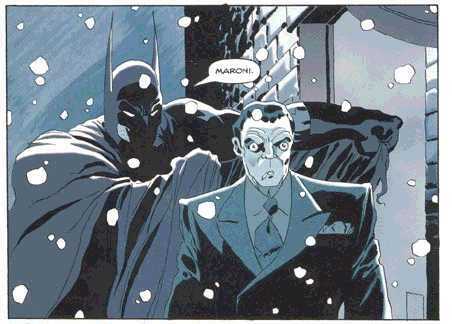 Before this, the character of Harvey was never fully explored, or at least to the degree writer Jeph Loeb accomplished in this book, so seeing the pre-disfigured side of Gotham’s one-time prodigal son added a unique dimension to the general “Batman pursues a crim” story The Long Halloween employs as its spine. Speaking of Loeb, this is easily tied for first as his best ever comics work, with the other recipient being his awesome Hush run (which, yes, has problems on a second readthrough, but I personally love the hell out of it). The introspection can get a little stilted at times, but overall the dialogue is solid and appropriate to each character. I feel Loeb gets a great handle on Batman’s thought process that’s neither overly verbose nor over-the-top hypermasculine, something he also brought across in Hush, and it’s really nice to read a book where that process feels somewhat more relatable. Also, at times there’s something of a wry black comedic tone going through things, with the highlight for me being a one-page series of panels where Batman spends Thanksgiving with someone…special. The art is…well, the art is by Tim Sale. Depending on your capacity for exaggerated forms and visual structure outside “regular” comic illustrations, you’ll either really love it or not care for it too much. I personally think Sale’s art is excellent, even if at times the darker palette can get a little off-putting and, at least in my older copy of the book, somewhat indistinct between background and character movement. 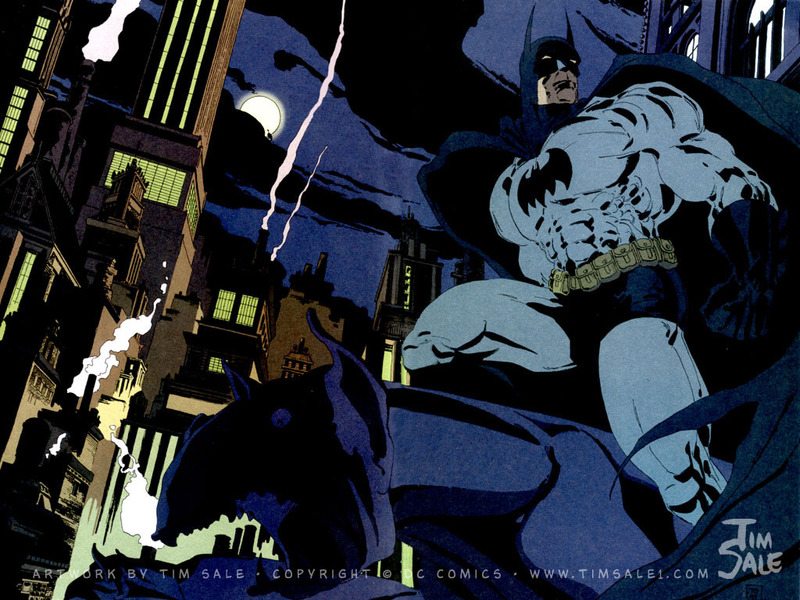 If you loved the really tall and pointy ears on the Batsuit in the Arkham videogames, you’ll probably love Sale’s art. 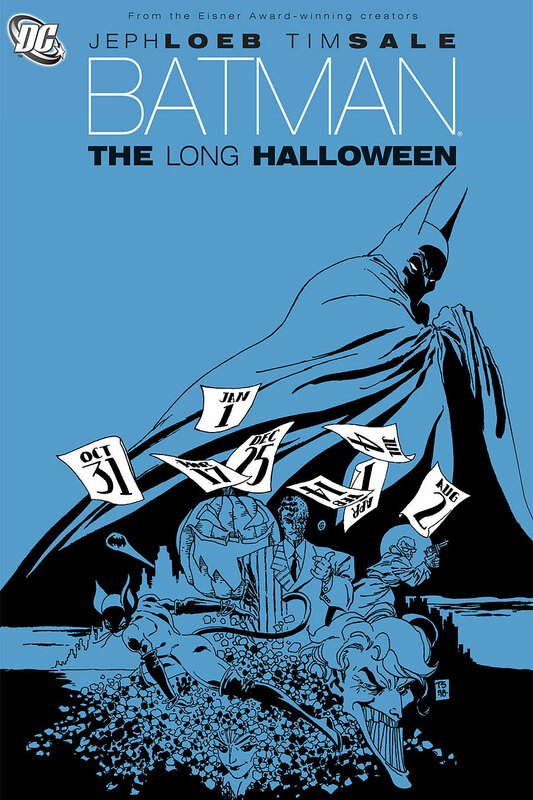 The Long Halloween provided the blueprint for much of The Dark Knight, and as mentioned came around at a time when readers seemed to be getting a bit sick of multiple-title narratives when all they want is a straightforward book they can buy month-to-month. 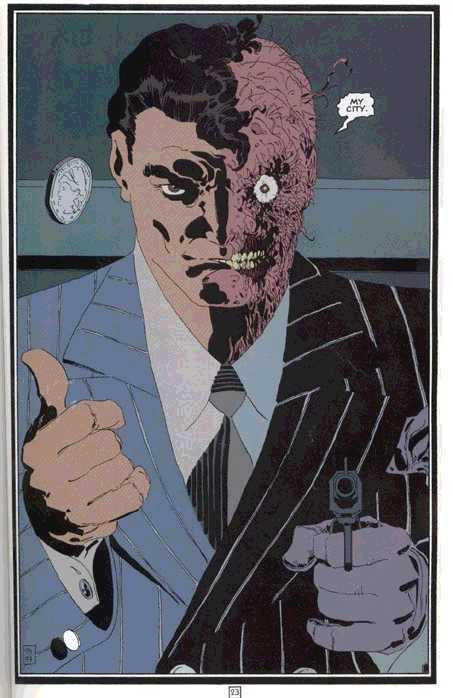 It’s possible Two-Face would be far more on the straight-villainous side of the spectrum rather than the tragic antagonist if it weren’t for his story; granted, he’s a nutcracker however you slice it, but at least The Long Halloween told us why, showed us how and really made the point that he was, if not a little unhinged, at least on the verge of it even before he copped an acid facial. It’s a real story on how devotion to an ideal and backwards-bending belief in justice can turn even the best of us into the worst. As with The Killing Joke, Batman faces a parallel here with Harvey Dent that implies what one of The Dark Knight‘s most famous quotes articulated – you either die a hero, or live long enough to see yourself become the villain. Just how far is too far? When does it stop? Where do you find the boundary in a man who has no boundaries? One of my favorite stories. I really enjoyed this recap, and I’ve been enjoying batman week. Thanks! Glad you’re liking it!